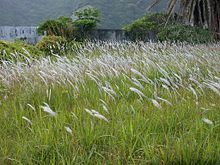 Imperata cylindrica (commonly known as cogongrass /koʊˈɡoʊn/, kunai grass /ˈkuːnaɪ/, blady grass, alang-alang, lalang grass, cotton wool grass, kura-kura) is a species of grass in the family Poaceae. Red cultivars of the species grown as ornamental plants are known as Japanese bloodgrass. It is a perennial rhizomatous grass native to east and southeast Asia, India, Micronesia, Melanesia, Australia, and eastern and southern Africa. It grows from 0.6 to 3 m (2 to 10 feet) tall. 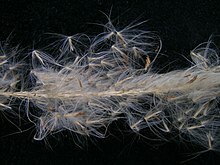 The leaves are about 2 cm wide near the base of the plant and narrow to a sharp point at the top; the margins are finely toothed and are embedded with sharp silica crystals. The main vein is a lighter colour than the rest of the leaf and tends to be nearer to one side of the leaf. The upper surface is hairy near the base of the plant while the underside is usually hairless. Roots are up to 1.2 meters deep, but 0.4 m is typical in sandy soil. It is used for thatching the roofs of traditional homes throughout south-east Asia. It is planted extensively for ground cover and soil stabilization near beach areas and other areas subject to erosion. Other uses include paper-making, thatching and weaving into mats and bags. It is used in traditional Chinese medicine. A number of cultivars have been selected for garden use as ornamental plants, including the red-leaved 'Red Baron', also known as Japanese blood grass. Young inflorescences and shoots may be eaten cooked, and the roots contain starch and sugars and are therefore easy to chew. It is used as an ingredient in the skincare brand Kiehl's Ultra Facial Cream for its high concentrations of potassium which provides a hydrating effect. Their website also states that indigenous native Australians may have used the plant as a substitute for salt due to its high saline content. The plant has become naturalized in the Americas, Northern Asia, Europe and Africa in addition to many islands and is listed as an invasive weed in some areas. In the U.S. it survives best in the Southeast (and, according to a 2003 survey, has overtaken more acreage in that region than the notorious kudzu), but has been reported to exist as far north as West Virginia and Oregon. Worldwide it has been observed from 45°N to 45°S. It grows on wet lands, dry lands, areas of high salinity, organic soils, clay soils and sandy soils of pH from 4.0 to 7.5. It prefers full sun but will tolerate some shade. In Florida I. cylindrica is found in areas where the soil has been disturbed, such as roadsides, building sites, timber harvesting areas, and borrow pits. It is able to invade both moist and dry upland pine forests. Once established it often forms dense monocultures. In addition to outcompeting species for resources, the grass also exhibits allelopathic tendencies. The chemicals it releases as well as the dense mat of vegetation that usually accompanies a cogongrass invasion gives it an advantage over indigenous plants. It spreads both through small seeds, which are easily carried by the wind, and rhizomes which can be transported by tilling equipment and in soil transport. In the Southeastern United States, state governments have various eradication efforts in place, and deliberate propagation is prohibited by some authorities. Control is typically by the use of herbicides. Currently, the most effective herbicides used to control growth are glyphosate and imazapyr. Burnoff is seldom successful since the grass burns at a high temperature causing heat damage to trees which would ordinarily be undamaged by a controlled burn and recovers from a burn quickly. Quarantine and extermination of this plant is especially difficult because cogongrass establishes root systems as deep as four feet, and regrowth can be triggered by rhizome segments as small as one inch. Cogongrass is difficult to contain mainly because it is highly adaptive to harsher environments, establishing itself on soils low in fertility. The grass also can grow on sand and clay, and consumers of it are few. The grass tends to be averse to dense shade, but reports indicate more shade-tolerant strains are developing. The legume vine Mucuna pruriens is used in the countries of Benin and Vietnam as a biological control for Imperata cylindrica. Anecdotal and empirical evidence suggests that types of this grass are quite flammable even when apparently green, particularly in Southeast Asian climates. It is not uncommon to see hillsides of cogongrass on fire. A common expression in the Philippines is ningas cogon ('cogon brush fire'). It is a figure of speech for procrastination, specifically people who show a fervent interest in a new project but lose interest quickly, in reference to the propensity of cogongrass to catch fire and burn out quickly. The plant contains the triterpenoids arundoin, cylindrin and fernenol. Imperata cylindrica was first described by Linnaeus in 1759 under the basionym Lagurus cylindricus. They were renamed by the French entomologist and botanist Palisot de Beauvois to the current accepted name of Imperata cylindrica. Imperata filifolia Nees ex Steud. 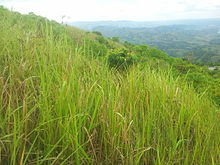 The species is most commonly known in English as "cogongrass", from Spanish cogón, from the Tagalog and Visayan kugon. Other common names in English include kunai grass, blady grass, satintail, spear grass, sword grass, and thatch grass, among other names. ^ a b c "Imperata cylindrica". Germplasm Resources Information Network (GRIN). Agricultural Research Service (ARS), United States Department of Agriculture (USDA). Retrieved 2016-04-03. ^ a b c "Imperata cylindrica (cogongrass)". Centre for Agriculture and Bioscience International (CABI). Retrieved November 16, 2016. ^ "Imperata cylindrica". www.sms.si.edu. Retrieved 2016-03-31. ^ "Imperata". Acupuncturetoday - traditional Chinese medicine (tcm). Retrieved 22 Dec 2014. ^ "Imperata cylindrica". PFAF. Retrieved 2016-03-31. ^ "Imperata cylindrica". Archived from the original on 2007-09-15. Retrieved 2007-08-12. ^ "Ultra Facial Cream 24-Hour Moisturizer - Kiehl's". Kiehls.com. Retrieved 2018-07-26. ^ "Cogongrass". Invasive Non-native Plants. Florida Department of Agriculture and Consumer Services. Retrieved 2013-11-25. ^ a b Long, Elizabeth A. "Identification and Control Methods for Cogongrass in Tennessee" (PDF). Tennessee invasives. University of Tennessee. Retrieved March 30, 2016. ^ Dozier, Hallie; Gaffney, James F.; McDonald, Sandra K.; Johnson, Eric R. R. L.; Shilling, Donn G. (1998-01-01). "Cogongrass in the United States: History, Ecology, Impacts, and Management". Weed Technology. 12 (4): 737–743. JSTOR 3989097. ^ "Imperata cylindrica | UF/IFAS Center for Aquatic and Invasive Plants". plants.ifas.ufl.edu. Retrieved 2016-03-31. ^ "Factsheet - Mucuna pruriens". www.tropicalforages.info. Archived from the original on 2008-05-15. Retrieved 2008-05-21. ^ "Species Description: Imperata cylindrica (L.) Beauv". Archived from the original on 2010-07-28. Retrieved 2010-12-16. ^ "'Establishment of Stylo (Stylosanthes Guianensis) in Kunai (Imperata cylindrica) pastures and its Effect of Dry Matter Yield and Animal Production in the Markham Valley, Papua New Guinea by P.A. Chadhokar" (PDF). Retrieved 2018-07-26. ^ "Fire leaves 20 without shelter". Postcourier.com.pg. Archived from the original on 2012-03-08. Retrieved 2018-07-26. ^ "Filipino Culture: What is Ningas Cogon". Archived from the original on 2011-01-15. Retrieved 2010-12-16. ^ Wunderlin, R. P., and B. F. Hansen. 2008. Imperata cylindrica. Atlas of Florida Vascular Plants <http://www.plantatlas.usf.edu/>.[S. M. Landry and K. N. Campbell (application development), Florida Center for Community Design and Research.] Institute for Systematic Botany, University of South Florida, Tampa. ^ "Imperata cylindrica". World Checklist of Selected Plant Families (WCSP). Royal Botanic Gardens, Kew. Retrieved 18 June 2017. ^ "Merriam-Webster Dictionary: Cogon". Merriam-webster.com. 2018-07-19. Retrieved 2018-07-26. Wikimedia Commons has media related to Imperata cylindrica. USDA Plants Profile for Imperata cylindrica (cogongrass) — invasive species. WageningenUR.nl: "From Imperata cylindrica Grasslands to productive Agroforestry" — Murniati PhD thesis (2002). United States National Agricultural Library, National Invasive Species Information Center: Species profile for Imperata cylindrica (Cogongrass) — information and control resources. Imperata cylindrica in West African plants – A Photo Guide.